In March 2005, we made our first joint research trip to Italy. Tehmina was already in Italy as the Tim Potter Memorial Awardee at the British School at Rome. Patricia Skinner also spent 3 weeks at the BSR to continue library-based documentary research on the Amalfitan mercantile diaspora. 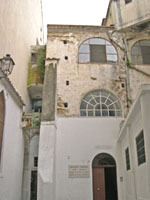 The main aims of the research trip were to establish contact with the Centro di Cultura e Storia Amalfitana and to trawl their book and journal collections for locally published material relating to a) Amalfitan merchants and trade and b) the art history and archaeology of the Amalfitan coast (la costiera amalfitana). The photographs below show a green grocers selling lemons, chillis and tomatoes, amongst other local produce; and a view of a crowd of medieval buildings, typical of Amalfi, still in use. The research trip also enabled us to get a feel for the physical space occupied by the medieval city. Did Amalfitan merchants trade from the city itself? To what extent? Was it feasible for Amalfi to manufacture metal and other objects? Where?